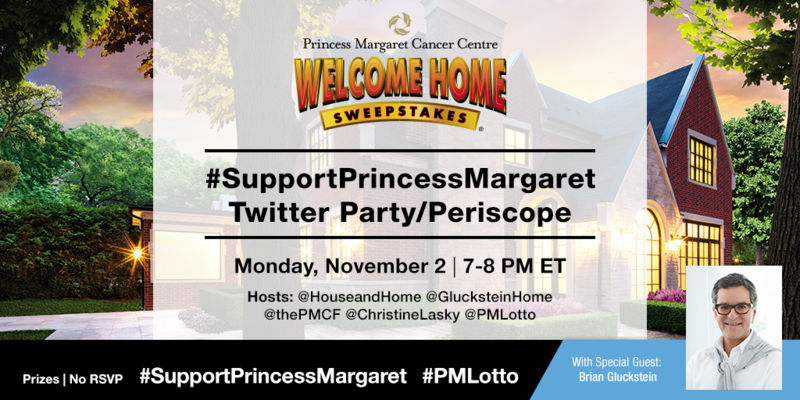 #SupportPrincessMargaret Twitter Party with Brian Gluckstein! The Princess Margaret Cancer Foundation Welcome Home Sweepstake is back again this year with bigger and grander prizes! Millions of Canadians support the Princess Margaret Lotto. Not only do you have a chance to win amazing prizes but proceeds from ticket sales support a great cause! The PMCF is considered the 5th largest Cancer research center in the world and contributes extensively to cancer studies, clinical care, education and training. Learn more about them here. But there’s something exclusive and special about this year’s @PMLotto because Brian Gluckstein is taking part in the sweepstake! Yes, that’s right! The renowned interior designer will also be taking part in the #SupportPrincessMargaret Twitter Party as a special guest AND engage with the audience through Periscope videos throughout the party. Mark your calendars and join in on the conversation with Brian to talk beautiful homes, finding cures and how we can all win with the Princess Margaret Cancer Centre. As a part of the Early Bird Contest, a gorgeous $1.1 million Muskoka Lakefront Cottage PLUS a $10,000 bonus cash is up for grabs! To learn more and order your tickets, click here. For easier access to the party, be sure to use the Twubs page here. Holt Renfrew invites you to put your best foot forward for an evening of charity shoe shopping. 10 % of all women’s footwear sales from the event will be donated to The Shoebox Project for Shelters, supported by DREAM. Leave behind your shoeboxes after you shop and Holt Renfrew will fill them with supplies for women in need and donate them to local shelters! Hey Buddy!, I found this information for you: "#SupportPrincessMargaret Twitter Party with Brian Gluckstein!". Here is the website link: http://shesinfluential.com/2015/10/28/supportprincessmargaret-twitter-party-with-brian-gluckstein/. Thank you.